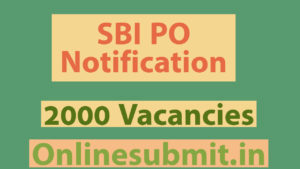 SBI PO 2019 Notification : State bank of India (SBI) given a bumper notification for the appointment of 2000 probationary officers (PO) in various branches of india. According to SBI PO 2019 notification pdf, only 2000 SBI PO Vacancies are recruited this year. Candidates who are going to apply for this SBI PO jobs must attend for prelims, mains, Group exercises and interview. Job aspirants can apply for this posts from 02-04-2019 to 22-04-2019 through online from the official website of state bank of india (SBI) i.e www.sbi.co.in. Education qualification : This who have degree from the recognized university are eligible to apply for this SBI PO posts and also candidates who are waiting final year exam results are also can apply. But they have to produce original mark sheet at the time of interview. Candidates age minimum should be 21 years and maximum is 30 years as on 01-04-2019. Relaxation is given for the reserved candidates. maximum of 13.08 lacs depending on place of posting and other factors. SBI PO Preliminary exam consists of questions of objective type. Exam will be conducted for 100 marks in the duration of 1 hour. Applicants has to pay the application fee through net banking/credit card/debit card after the filling of SBI PO 2019 application form. Before applying candidates must have valid email ID and mobile number which should be kept active til the declaration of sbi po 2019 results. This email id and number helps in communicating about important events of sbi po exam. Candidates should register the name in the bank website https://bank.sbi/careers/ or https://www.sbi.co.in/careers/ in the prescribed mentioned dates by paying application fee through NET Banking/debit card/credit card. Before filling SBI PO 2019 application form candidates must have scanned passport size photograph and signature. Now applicants need to visit the bank website by typing url which is mentioned above in the internet browser and open the Online Application Form, available under ‘Current Openings’. Now the applicants are allowed to fill the SBI PO application form in the empty blanks with correct details by uploading photo and signature in the correct place. If you are not able to fill the sbi po online for at a time you can save the data and submit. Once you submit registerd number and password is generated on the computer screen. Note down it which helps the applicants to again open the application and edit the data. The facility of editing the application form is given only three times. Once the application is completly filled, you can pay the sbi po application fee through payment gateway which is integrated with the application form. The application fee can be paid by using any of the options such as net banking/credit card/debit card. On successful payment of fee, e-receipt is generated take down it. After submission of application now you can take the print out of the application. To attend for preliminary exam, mains exam and interview call letter is compulsory. So, you can download SBI PO 2019 admit card from the official website of sbi before 15 days of examination. No hard copy of call letter is sent through post. Declaration of SBI PO Results date for the preliminary exam, mains exam and final result is given in the tabular form below. Conduction of SBI exams for preliminary, mains and pre-examination training dates is given below. Candidates who are passed for prelims exam will be allowed for mains exam.